For travel to places like Hakone and Kusatsu onsen, will there be a strong WIFI signal? Will a portable pocket WIFI or simcard be better for travel to these places? Is it better to buy these in advance before going to Japan? Often public WIFI is worthless. You can get good wifi at specific places like train stations and stores, but when you're out on the street, no way, let alone in the countryside. A rented portable WiFi from GAC uses DoCoMo phone signal and converts it to WiFi. That's what I've been using on my last 8 trips to Japan. The only loss of signal is in the tunnels and in very remote areas. I guess people are talking about smartphones or registration in English, but I'd like to note just for reference that I never had a problem using free WIFI with my 13x21cm (5x8inch) Windows tablet, even when I'm outside Japan. Among the handy ones is the WIFI you can use at any 7/11 store throughout Japan, except that I recall the registration page is only in Japanese. The portable Wifi's I've found to be pretty good in general. They also tend to be more forgiving in terms of download compared to what you may have on just a sim - but there is a price difference as a result. The problem with free WiFi is that it's on an unsecured network. Use it at your own risk. Let me answer to your question one by one. >For travel to places like Hakone and Kusatsu onsen, will there be a strong WIFI signal? As others on this board have already said, there are some free WiFi spots as both places are popular tourist spots. However, there are 3 issues you should consider about. 1. There are SOME free WiFi spots, so you don't expect to be get connected through your travel (if you are considering use only free WiFi). 2. Mostly they are not secure and not recommended when you use your personal information (e-commerce, bookings). 3. On some free WiFi spots, you need to do bothering procedures to log in everytime their free times expired. >Will a portable pocket WIFI or simcard be better for travel to these places? That's why, I would like to say to that question, yes. >Is it better to buy these in advance before going to Japan? Still you can purchase them after arriving Japan, I recommend you to pre-order it through online. By doing that, they deliver it to your places (ex. airports, hotels). Lastly, I just put a (almost) comprehensive list for data SIM cards and WiFi routers to find the best suit for your trip style as well as a website for comparison between SIM and WiFi. Thank you for your responses, so helpful! I will need to pick up a pocket wifi early morning at Haneda Airport. I saw that there is an option with Japan Railpass Pocket Wifi to pick up at the airport at a 24 hour counter. Does anyone have any experience with this pocket wifi? I was looking at Japan Wireless pocket wifi but I think it can only be picked up after 8am at the airport. 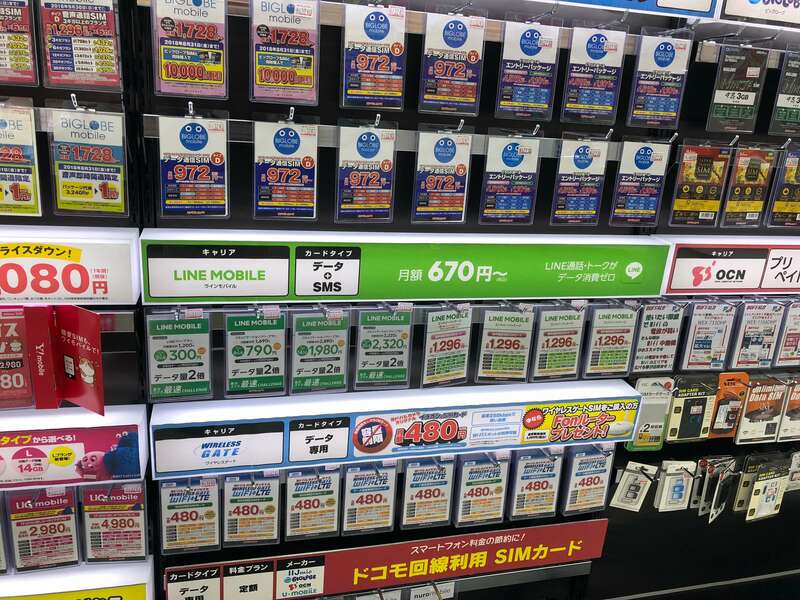 You can also purchase "SIM" at Haneda airport(HND), many kinds. And do not forget to check the size of SIM. This is Narita Airport(NRT) version for other readers, the list is almost new. Basically, most int'l airports in Japan web are mentioned info in English, including the mobile. Int'l terminal building of HND was later built, Web URL is different from the Dom terminal. Any airport, they do not grasp all product information, be carefull. so you do not have to buy it in advance at the airport in Japan. The advantage of the portable wifi is the increased amount of included download you can get - plus speeds can be faster compared to a sim card. To those who don't know - it uses the 4G and LTE cell phone network and does not have the problem of possible limitations of pairing up a laptop from your phone in relation to speed. I used to work in tech support for an internet company in a previous working life. You should have no problems in Hakone and Kusatsu Onsen. There might be some areas on the bus out to Kusatsu Onsen which may not have have coverage for very limited areas. If you are doing some major hiking near Kusatsu onsen up in the mountains, there might be some areas without coverage.